Amanda Handel is a composer navigating the nexus of contemporary classical and world music. In 2012 Handel released Gardens of Stone - an album of works for piano and didjeridu. She worked in collaboration with Michael Jackson who is an important exponent of the didjeridu. The title work, Gardens of Stone, was premiered in 2010 by Camerata Ardeskoin a version for string orchestra and didjeridu in Amsterdam, and the group continue to include the work in their 'Wild Country Australia' touring series. In 2004 and 2007 Handel studied flamenco music with pianist/composer Pedro Sarmiento in Madrid. While in Spain, she drafted instrumental scores and made field recordings for a CD project. Collaboration with sound designer G.L. 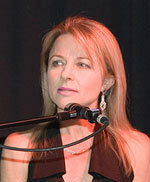 Seiler, the album Ghosts and Angels was released in 2006 on the Feral Media label and was a finalist in the Australian Music Prize. Chamber works commissioned in 2002 include Dry Red, which was premiered at the Darwin International Guitar Festival, and Red, Yellow, Black and White: Music for Reconciliation for two pianos and percussion, commissioned by Ars Musica Australis. The premiere, given by Daniel Herscovitch, Michael Leslie, Daryl Pratt and Alison Eddington, was recorded and broadcast on ABC-FM. The Sydney Guitar Trio premiered Dances to the Night Sky at the 1999 Darwin International Guitar Festival and included it on their CD. Carolyn Kidd and Virgina Taylor performed Goarounds and Grounds in a concert broadcast live on ABC-FM radio. Also in 1999, The Song Company included Sznuvah Szn on their program for the 'Sagra Musicale di Perugia' international festival in Italy. Several of Handel's compositions were selected for presentation at the National Festivals of Womens' Music in Canberra, 2001, and Sydney, 1997. Many of her works have been choreographed for dance performances. In 2003 Handel completed an M.A. (Hons) degree at the University of Western Sydney. Her thesis Music of Balance: Circles and Squares includes a large portfolio of original scores and acoustic recordings which explore mandalas in music. She has studied soprano saxophone with Sandy Evans and performed in several jazz and world music ensembles. She has considerable experience in flamenco dance and has also collaborated with contemporary dancers and choreographers. Handel is currently a student of the Alexander technique, exploring its inclusion into her music making. Handel is a qualified and accredited piano teacher holding AMusA and ATCL (T. Dip). She has been teaching piano at the JS Centre since 1991 and has lectured in harmony, analysis and composition at the University of Western Sydney. Without feet they dance : for solo guitar (2003) Commissioned by Paul Nash. Dry red : for guitar, violin, cello & percussion (2002) Commissioned by Adrian Walter for performance by Darwin International Guitar Festival. Zardash (solo piano) (2001) Written for Aaron McMillan at his request for his CD "Arc of Light"
Red, yellow, black & white : Music for reconciliation : for two pianos & double percussion (2000) Commissioned by Ars Musica Australis. Dances to the night sky : guitar trio (1999) Commissioned for Darwin International Guitar Festival 1999.